Follow Highway 97 south from Okanagan Falls in the warmer months of the year and you'll be greeted by a pretty, blue lake dotted with lilypads and lined with steep cliffs. This lake is Vaseux Lake and it's one of the most underrated bass lakes in B.C. Vaseux Lake has it all, big largemouth bass, plentiful smallmouth action when the largies aren't co-operating, and a host of other species including rainbow trout, black crappie, yellow perch, pumpkinseed sunfish, brown bullhead, and carp. The type of bass fishing available ranges from rocky dropoffs, fallen trees, and thick weedmats. There's really a little bit of everything in this lake. Anglers preparing for a day on Vaseux. Big largemouth bass are nothing new to Vaseux Lake. Rumours of fish over 10 pounds are widespread, and I've also seen pictures of a legitimate 9 pound 4 ounce specimen pulled from this average-sized lake. My personal best largemouth came from Vaseux Lake back in 2006 and tipped my Berkley digital scale at 9 pounds even. Another picture of an 8.5 pound specimen caught from shore by lure maker Dean Ostrowercha has been circulated through tackle shops in the Okanagan. 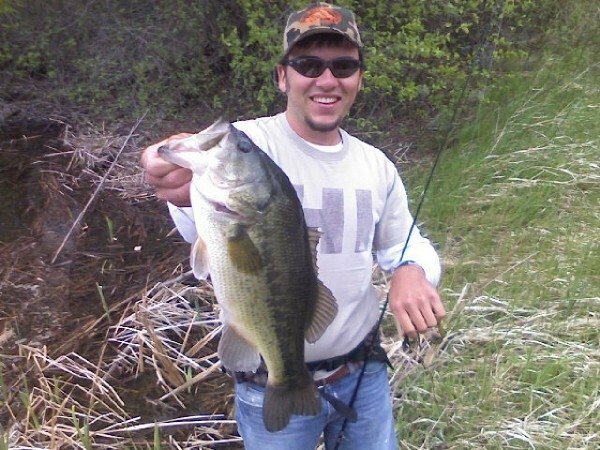 While these fish are outliers, bass in the 3 to 5 pound class are common and can be found throughout the lake wherever the weeds grow. Yours truly with a 5+ pounder caught from the shores of Vaseux Lake. The smallmouth bass don't grow quite as big as the Vaseux largemouths, but fish in the 2 to 3 pound range can be caught consistently. I have yet to hook anything north of 4 pounds out of here, but have heard reports of bronzebacks up to 6 pounds. These fish congregate around the rocky dropoffs of the lake and can be found in good-sized schools once located. Finding lodging near Vaseux Lake is no problem at all, as there are several campsites within a short drive and one provincial campsite right on the lake. There is also the Vaseux Lake Resort at the south end of the lake which also rents rowboats. 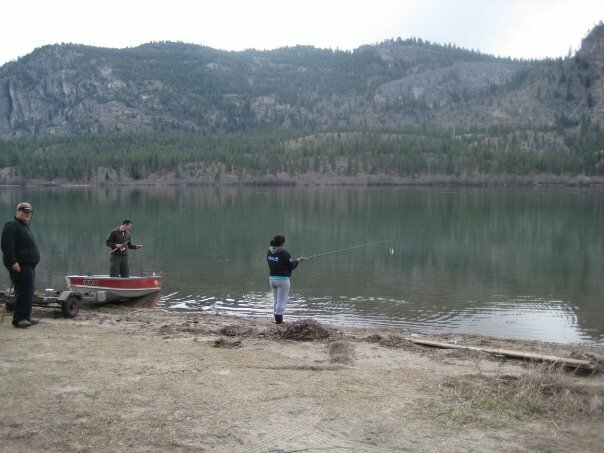 Nearby Okanagan Falls is a good place to stock up on supplies, but if you need tackle, I recommend either the Home Hardware in Osoyoos if you're coming from the south, or the Canadian Tire in Penticton if coming from the north as there aren't any tackle shops in Okanagan Falls. After all this talk of big, plentiful bass I bet you're interested in checking out this lake. However, there's a catch and it might be a deal-breaker. The longtime bane of bass fishermen at Vaseux Lake has been the total motor restriction that's been in effect due to the area's classification as a nature sanctuary. That means no gas OR electric motors are allowed at all and the lake's residents are quick to enforce this as I witnessed one day as a wayward fisherman attempted to fire up his aluminum boat's gas motor and was nearly lynched by two locals. The frequent winds can make rowing an absolute chore and may just push you down the Okanagan River at the south end of the lake. I'd recommend bringing a canoe. That said, if you decide to tough it out and muscle your way around the lake (or you have a friend that owes you one) Vaseux Lake is one of the best bass lakes in the province for both size and quantities of fish, as 50 fish days are entirely possible for the abundant smallmouth. But chasing potential Canadian-record largemouth can be even more exciting, especially in shallow, clear water. 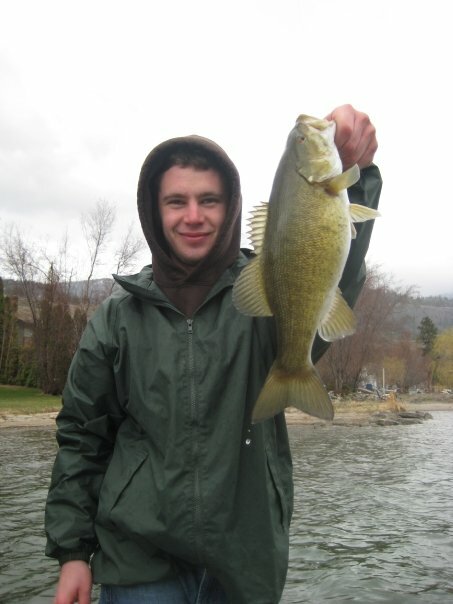 A good-sized Vaseux Lake smallmouth. You'll find the spinning rod is best suited for fishing smallmouth, while the sturdier baitcaster works well for muscling the shallow largemouth out of the weeds. If you're interested in trying some bigger lakes in the area such as Skaha and Osoyoos and are in need of an expert guide, drop me a line at bcbasscharters@gmail.com. Good luck!